Swedish dishcloths replace kitchen sponges and paper towels. They’re simple, smart, and pretty! This post is sponsored by MightyNest. As always, I’m happy to recommend them, and grateful that they carry such a wide selection of healthy products for my home! Do you have any pet peeves that you’ve carried with you from childhood? For my part, I’m afraid I’ve never liked the ubiquitous kitchen sponge. Kitchen sponges get too nasty too quickly. Yes, you can pop them in the dishwasher, but you need to do this pretty often to offset the smell. And the more you wash them, the faster they break down. Pretty soon you toss them in the trash, grateful for an excuse to break out a brand-new sponge…and start the vicious cycle all over again. Why am I telling you all this depressing stuff? Because kitchen sponges don’t have to gross you out anymore. Swedish dishcloths are the simple, smart alternative to conventional kitchen sponges. Made of a blend of cotton and cellulose, Swedish dishcloths are a multi-tasking kitchen tool that will not only replace your kitchen sponges but much of your paper towel usage, too! As I mentioned in this post, I began using them several months ago and now I doubt my kitchen will ever be without them. My Swedish dishcloths are from MightyNest, an online general store that sources natural products for your home and family. Most kitchen sponges are just plain yellow or blue, and even prettily-patterned paper towels end up in the trash. 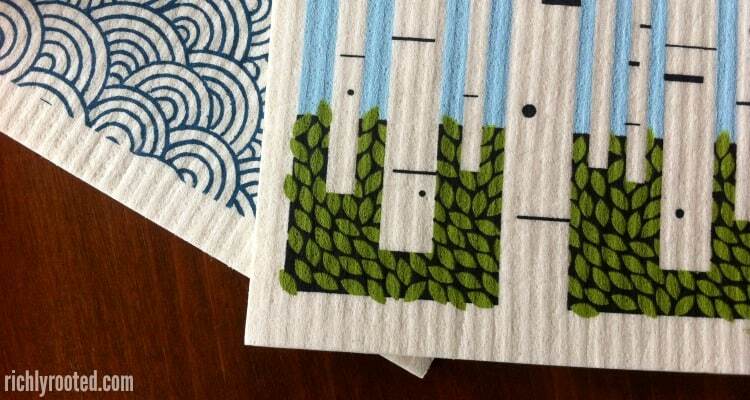 The Swedish dishcloths from MightyNest are printed with clean, Scandinavian-style designs made with water-based inks. No, of course it’s not a must to have pretty sponges in your kitchen…but they do add a bit of personality and liveliness to a place where you spend so much of your time! These hard-working dishcloths can absorb 15 times their own weight! They clean up food and drink spills like a charm, and won’t leave streaks on your appliances or glass cook top. If you have young children, keep a Swedish dishcloth handy at mealtimes to quickly absorb any spilled drinks. 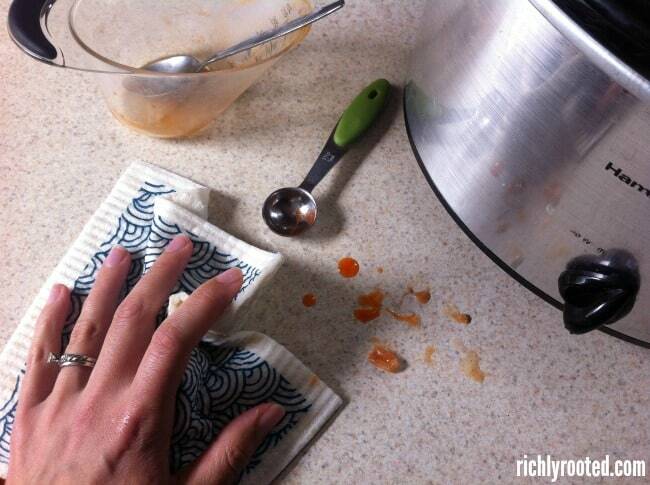 They work much better than a thin paper towel or a pile of napkins! 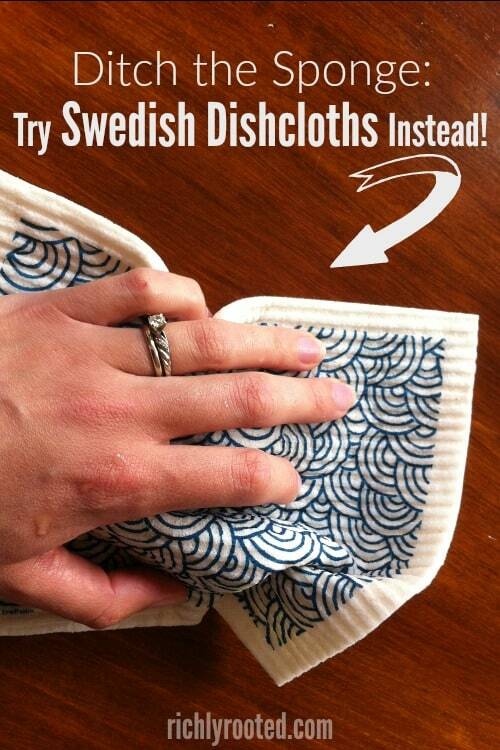 With proper care, you can use the same Swedish dishcloth for 9-12 months! Washing your dishcloth is easy. Usually you can just rinse it out and let it air dry, but when it starts to get soiled simply put it in the top rack of your dishwasher, or even toss it in the laundry! Once washed, wring it out and let it air dry (I usually just lay mine over the dish drainer). For further sanitation you can also boil it, or wet it and then microwave it for 30 seconds. Eventually the fibers in the Swedish dishcloths will break down, but it will be many, many washes before that happens. And when your dishcloth is no longer useful in the kitchen, you can compost it. Would you like to try two Swedish dishcloths for just $1.00? Swedish dishcloths are normally $5.99 each (plus shipping) from MightyNest, but if you join their MightyFix program you can get an even better deal–two for $1.00! The goal with the monthly MightyFix subscription is to let you incorporate natural products into your life in a frugal, non-overwhelming way. Each month is a surprise, but typical items include things like a glass water bottle, reusable stainless steel straws, natural sunscreen, wool dryer balls, etc. You’ll always get something that’s useful in any household; not just for families with children. You pay just $10 per month, (after your initial $1.00), but the value of the item(s) you receive will always be at least $10, if not more! Shipping is always free*, and you can add any other MightyNest products to your order and get free shipping on those, too! Another thing I appreciate about MightyNest is that they give back by donating up to 15% of every purchase you make to your local school! This includes your monthly MightyFix shipment, as well as other products you add to your order. If you do not have children in school you can choose to donate to your grandchild’s school or to a niece’s or nephew’s. To start getting the MightyFix, you can subscribe via this link. Your first month will only cost $1.00, and will include the Swedish dishcloths! Clicking through this link will apply the discount to your cart, but you can also enter the code ROOTEDDISHCLOTHS at checkout. If you’ve ever wished you had a better alternative to kitchen sponges, give Swedish dishcloths a try! This post is sponsored by MightyNest. As always, I’m happy to recommend them, and grateful that they carry such a wide selection of healthy products for my home! Thank you❤I ordered two weeks ago or less from your link. I totally love these dishcloths. Enough so I want to get a few more. Now I let others know about them. That’s awesome! Yes, someday I want to have a whole little stack of them in a kitchen drawer! Can I order the Swedish dishcloths w/out signing up/paying for the monthly subscription? These are nothing more then sponge cloths with printing on them. Nothing more, nothing less. The cloths look to be made in Germany. They are economy friendly,mashine washable and last 10 times longer than a regular sponge. Yes, as Autumn says, they work harder than a regular sponge! Yes, Alicia! You can, although not for the discounted price! Here is the product listing. You can, although not for the discounted price! Here is the product listing. Can I purchase without a subscription? I may be wrong but I think you can. Lajuana, yes you can, although not for the discounted price! Here is the product listing. I AM STILL WAITING FOR MY SWEDISH DISH CLOTHS….IT HAS BEEN WEEKS AND I AM SO LOOKING FORWARD TO RECEIVING THEM! COULD YOU PLEASE CHECK ON MY ORDER? Hi Simone! I saw your email that they’d arrived! Enjoy! I have dish cloths that I have used for years. I don’t use paper towels. A regular cotton dish cloths are more economical. That is great! Many people think of paper towels as a necessity, but they ARE a habit you can break! I find this post to be extremely disingenuous… It reads like a personal blog post, but it’s paid for by the company “you are recommending.” Are you being paid to recommend this too, or are you a Mighty Nest employee?? Shady. Yes, this is my personal blog! I’m not a MightyNest employee, I just enjoy and support the company! I occasionally write posts on my blog that are sponsored by particular companies that I know are in line with my readers’ interests and values (and my own). As a reader, I’ve learned about some of my very favourite natural and small business companies via blogs, and I’m so grateful for that and for the chance to now pass on these resources to others. I use the Swedish dishcloths in my own kitchen, and that’s how I’m able to say so many good things about them! What’s the absorbent part made of? Is it anti microbial? Lisette, it’s made of wood cellulose…and I’m finding out if it’s antimicrobial or not! I will let you know as soon as I find out! Do they get stinky like regular dishcloths and sponges? Not very quickly, and that’s one of the reasons I like them. If it does start to get smelly, or to prevent it from getting smelly, I pop it in the dishwasher every now and then and that cleans it right up. You can also boil it, put it in the washing machine, or wet it with water and then microwave it. Those are all ways to sanitize it and keep it fresh. I’m sorry, Miller, but MightyFix does not ship to Mexico! I have a couple of these and simply love them. I am wondering what some of the monthly items are before I sign up. Patty, they are things like reusable/non plastic food storage, wool dryer balls, glass spray bottle w/ natural all-purpose cleaner, Beeswrap (an alternative to plastic wrap), glass/silicone water bottle, non-toxic candles. You mentioned that you can compost them when they start to break down to much to use. Does that mean you could use as a weed liner in the garden? I know you can put them in the compost pile. I am not positive how they would work as weed liners–I think it might work, but I am not sure! Absolutely! That’s where all my used ones go!! Can you opt out at any time? If I decide I’m not happy with the products. I am also wondering this. Also, do you get to preview the products before they ship and skip that month if it’s something you can’t use? I don’t need any more glass water bottles, for instance. Joan, yes, you can opt out any time! You don’t get to preview the items first, though. What I recommend is to keep any items you don’t want to give as gifts. Some of them make really nice hostess gifts, stocking stuffers, wedding shower presents, housewarming gifts, etc! Yes, you can opt out at any time. That’s awesome! I wish I had some of those! Hi, is the 2 for 1 deal still going on? I went to the website but the swedish cloth is still priced as 5.99 with subscription? Hi Alice, yes, the deal is still available! 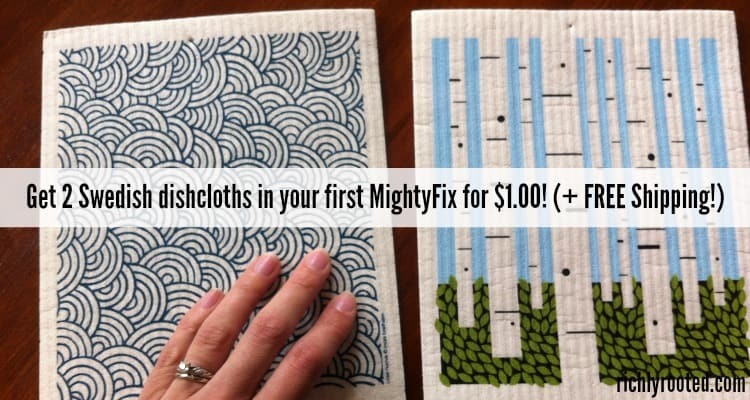 If you click through the links in this post (here it is: https://mightynest.com/the-mighty-fix?apply_promo_code=ROOTEDDISHCLOTHS) the discount will be automatically applied and should show up in your cart when you go to checkout. Let me know if that is not the case! Is this the same as Mighty Nest? I’ve heard of that. What’s the difference? Yes, it is. MightyNest started a subscription service called the MightyFix, where you get an item in the mail each month and free shipping. It is all the same company and small business, though! Can we order this subscription discount through regular mail? I don’t like buying anything on line. Hmm, I am not sure about that! I would email their customer service to check! Their email address is [email protected]. You can also call them during business hours at 847-905-0567. These are like using a hand full of wet toilet paper, and not very absorbent! No thanks I will keep using my cotton dish cloths, and wash them as needed. 10-20 seconds in the microwave will kill anything on them between washes. Huh…I’ve never tried using a handful of wet toilet paper, so I guess I’ll have to take your word on that comparison! I do find these dishcloths to be very absorbent for wiping up spills! If you like Swedish dish cloths, you’d love Norwex cloths even more. http://jenbl.norwex.biz. They’ll save you even more time and money and they are self purifying, so you don’t have to launder as often. I have a couple of Norwex products and have been pretty pleased with them! I buy the sponge-cloths in the grocery store that are much less expensive and seem to be the same thing (other than the decoration.) I DO wash mine in the laundry over and over and they seem to hold up well. What’s the difference? I’m not sure of the differences between specific brands. I know the cheap sponges I used to get did not hold up as well as these, nor did they dry as quickly. It sounds like you have found something that works well for you, though! No need to switch if you like what you’ve got! I started using these when a local boutique began carrying them. Love them! They last and I love their designs. I think they are gaining a fan base, as I’ve heard of other stores begin to carry them! They are great! I assume, like most kitchen sponges, they do not have an abrasive surface to clean pots with, so one would still need a conventional sponge. I buy the sponge-cloths in the grocery store that are much less expensive and seem to be the same thing. I’m not sure of the differences between specific brands. What’s the difference? If you had more insight i will greatly appreciate it. I have some Full Circle brand sponge-cloths from the store that might be similar to what you get. To me, the main difference is that the Full Circle ones tend to “flake” and break down sooner than my Swedish dishcloths. The texture is also different, so they don’t offer as clean of a wipe. And the last thing is that the Full Circles take a little longer to dry. But, as far as specifics with how the Swedish ones are made or the difference in material type, I would email MightyNest to ask…because I’m not sure! I just know that side by side, the Swedish dishcloths perform better. Was anyone able to find out if the dish cloths are antibacterial? I don’t think that they are.